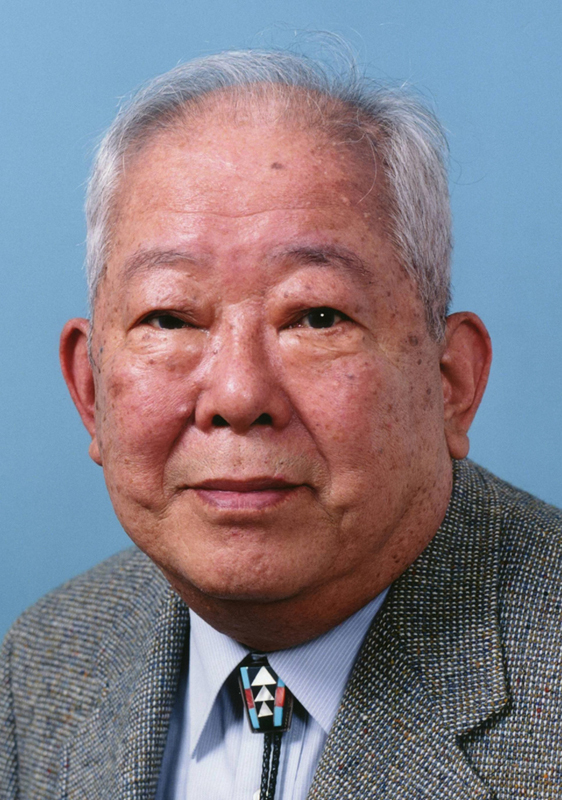 Masatoshi Koshiba (小柴 昌俊, Koshiba Masatoshi, born September 19, 1926) is a Japanese physicist, known as one of the founders of Neutrino astronomy and jointly won the Nobel Prize in Physics in 2002. Koizumi Cabinet E-mail Magazine, No.74, December 12, 2002. He is now Senior Counselor of International Center for Elementary Particle Physics (ICEPP) and Emeritus Professor of University of Tokyo. Koshiba's award-winning work centred on neutrinos, subatomic particles that had long perplexed scientists. Since the 1920s it had been suspected that the Sun shines because of nuclear fusion reactions that transform hydrogen into helium and release energy. Later, theoretical calculations indicated that countless neutrinos must be released in these reactions and, consequently, that Earth must be exposed to a constant flood of solar neutrinos. Because neutrinos interact weakly with matter, however, only one in a trillion is stopped on its way to Earth. Neutrinos thus developed a reputation as being undetectable. In the 1980s, Koshiba, drawing on the work done by Raymond Davis Jr, constructed an underground neutrino detector in a zinc mine in Japan. Called Kamiokande II, it was an enormous water tank surrounded by electronic detectors to sense flashes of light produced when neutrinos interacted with atomic nuclei in water molecules. Koshiba was able to confirm Davis's results—that the Sun produces neutrinos and that fewer neutrinos were found than had been expected (a deficit that became known as the solar neutrino problem). In 1987 Kamiokande also detected neutrinos from a supernova explosion outside the Milky Way. After building a larger, more sensitive detector named Super-Kamiokande, which became operational in 1996, Koshiba found strong evidence for what scientists had already suspected—that neutrinos, of which three types are known, change from one type into another in flight; this resolves the solar neutrino problem, since early experiments could only detect one type, not all three. 2003 – In commemoration of the Nobel Prize-winning by Masatoshi Koshiba, Koshiba hall was established at the University of Tokyo's School of science. Koshiba, M.; Fukuda, Y; et al. (1998). "Evidence for Oscillation of Atmospheric Neutrinos". Physical Review Letters. 81 (8): 1562. arXiv:hep-ex/9807003. Bibcode:1998PhRvL..81.1562F. doi:10.1103/PhysRevLett.81.1562. Koshiba, M.; Fukuda, Y; et al. (1999). "Constraints on Neutrino Oscillation Parameters from the Measurement of Day-Night Solar Neutrino Fluxes at Super-Kamiokande". Physical Review Letters. 82 (9): 1810. arXiv:hep-ex/9812009. Bibcode:1999PhRvL..82.1810F. doi:10.1103/PhysRevLett.82.1810. ^ The Nobel Prize in Physics 2002. Prof. Koshiba has won the Nobel prize.